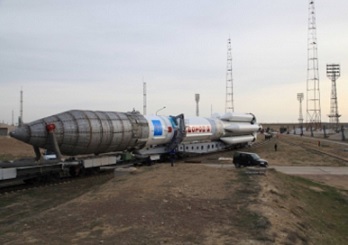 Russia conducted another launch of the Proton-M launch vehicle early on Monday, tasked with lofting the KazSat-3 telecommunications satellite and the Luch-5V relay satellite. 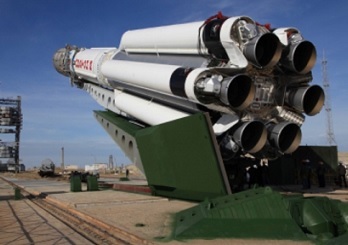 Launch of the Proton-M rocket took place from Launch Pad 81 at the Baikonur Cosmodrome in Kazakhstan at 04:25 GMT. Spacecraft separation for both satellites was confirmed later in the day. The Proton vehicle has a rich heritage of hundreds of launches since 1965 and is built by Khrunichev Research and State Production Center, one of the pillars of the global space industry and the majority owner of International Launch Services (ILS) who fly commercial missions via the rocket. Monday’s launch was initially thought to be the debut of an enhanced version of the rocket, known as the Phase IV. 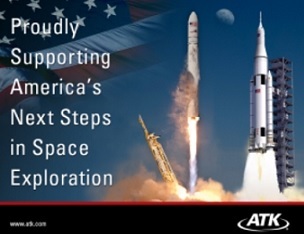 However, sources later noted this launch continued the use of the Phase III vehicle. The Phase I configuration of Proton-M launcher carried out nearly all of the commercial missions in the 2004 to 2009 period. The last commercial Phase I Proton-M flew the Astra 1M mission for SES in November 2008. 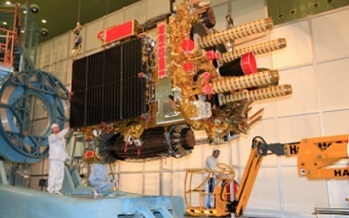 The Phase II Proton-M rocket flew for the first time in July 2007 with the successful launch of the DirecTV 10 satellite. The last commercial Phase II Proton-M flew the Skyterra 1 mission for LightSquared in December 2010. The Phase III Proton-M launch vehicle was flight proven on the Russian Federal dual mission of Express AM-44 and Express MD-1 in February 2009 and performed its first commercial launch in March 2010 with the Echostar XIV satellite. The Russian government will eventually start using the Proton-M the upgraded Phase IV configuration. Khrunichev had initiated development of a set of phase IV enhancements in order to keep pace with market demands and the mass growth trends of commercial satellites. As a result the Payloads Systems Mass performance for phase IV has been increased to 6300 kg to a reference GTO orbit with 1500 m/s of residual delta V to GSO. The Upper Stage is the Briz-M, which carries out multiple burns to deploy the satellites into their respective orbits. The telecommunications spacecraft KazSat-3 is the result of an arrangement between the Academician M.F. Reshetnev Information Satellite Systems and the Republican Center of Space Communication in Kazakhstan. Under the terms of the agreement ISS-Reshetnev was responsible for the design, development, production, integration and testing of the KazSat-3 satellite as well as the establishment of a central ground control center (Akkol) and a reserve one (Almaty). The satellite is based on ISS-Reshetnev’s middle-class unpressurised platform Express-1000HTA and will accommodate the communications payload delivered by Thales Alenia Space Italia S.P.A. in Italy. KazSat-3 sports 28 Ku-band transponders, thus ensuring full coverage in the territory of Kazakhstan. The spacecraft is expected to enjoy a 15-year service life. The Luch-5V relay satellite is based on the Express-1000K satellite platform. Its role is to relay data from Russian spacecraft to ground sites. It will also handing data from the International Space Station. 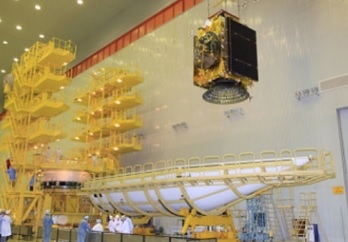 This 1,140 kg satellite is the third of the new fleet of Russian relay satellites and will complete the small group that is made up of Luch-5A – which was launched in 2011, while Luch-5B followed a year later. Luch-5A is expected to have a lifetime of 15 years.